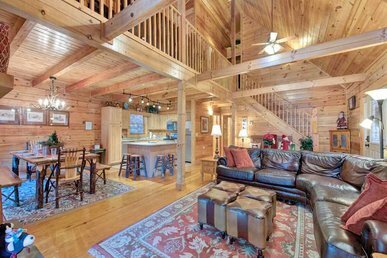 A four-bedroom log home that sleeps ten people, Mountain Top View does indeed offer views of the Great Smoky Mountains. 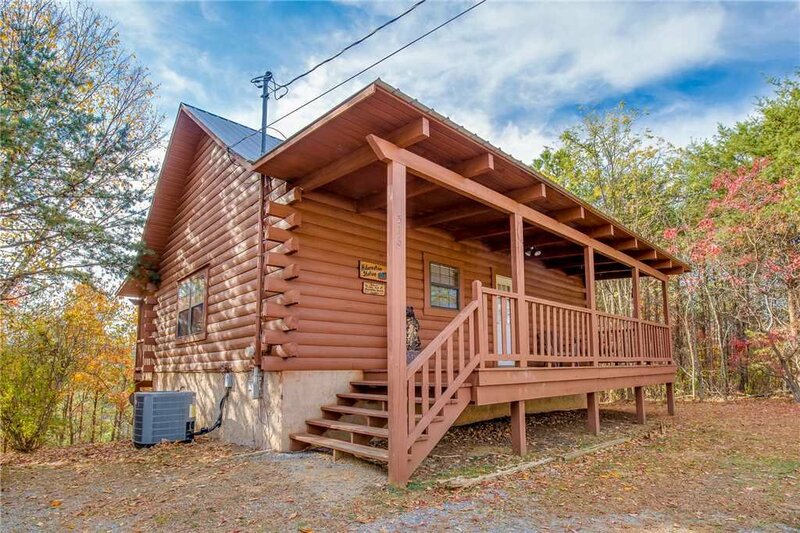 It offers plenty more as well, including a hot tub, a game room, a peaceful wooded setting, and close proximity to both Gatlinburg and Pigeon Forge. 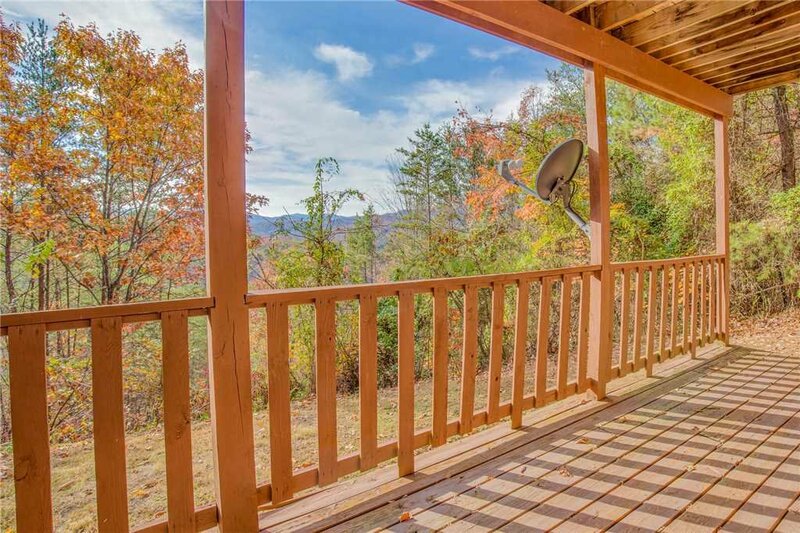 With two covered rear decks that span the width of the cabin plus a covered front porch and even a small yard, Mountain Top View allows everyone to relish the stunning scenery and the crisp mountain breeze. 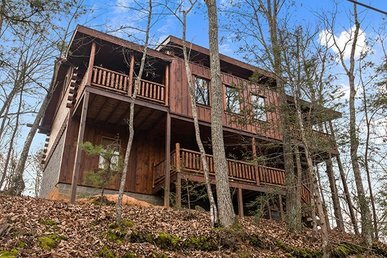 As well as plenty of rocking chairs (a Smoky Mountain cabin must), you can kick back on the deck swing—the kids will enjoy it during the day, and romantic adults will do the same under the starry night sky. 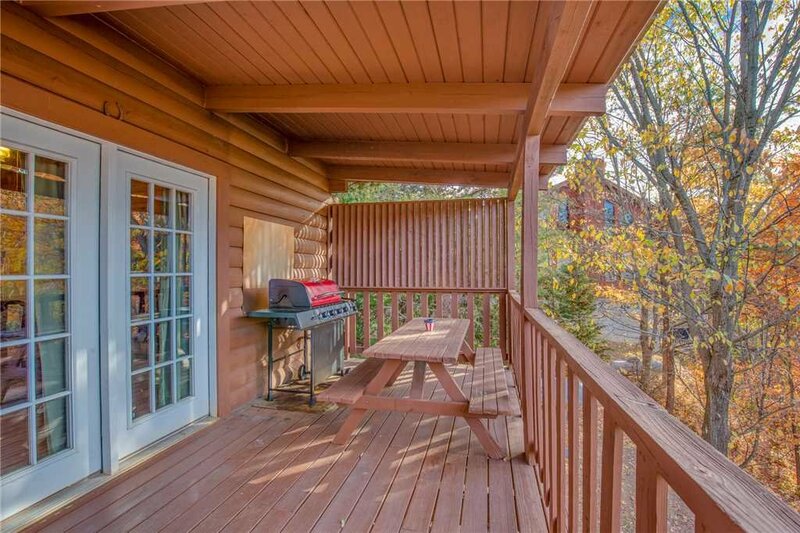 You can cook on the deck, on the large gas grill, and eat out there as well at the picnic table. 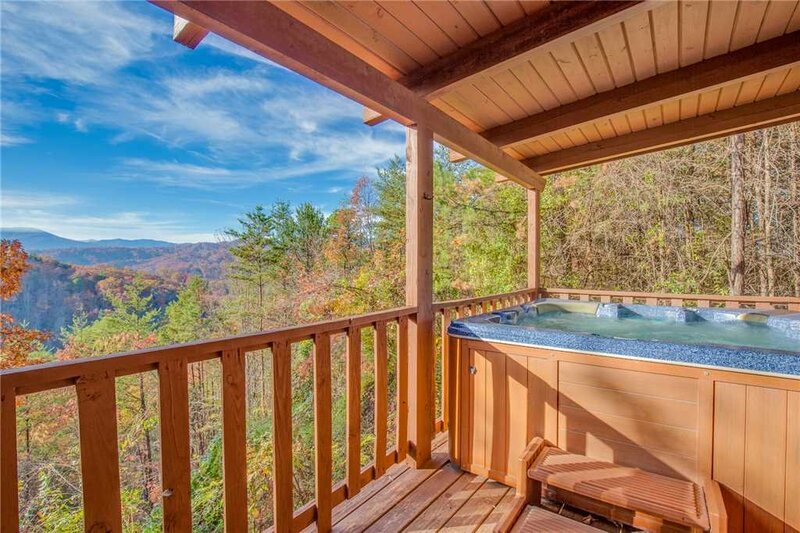 Most pampering of all, you can indulge in a restorative soak in the deck’s hot tub; it’s an idyllic way to watch the sunset over the mountains. 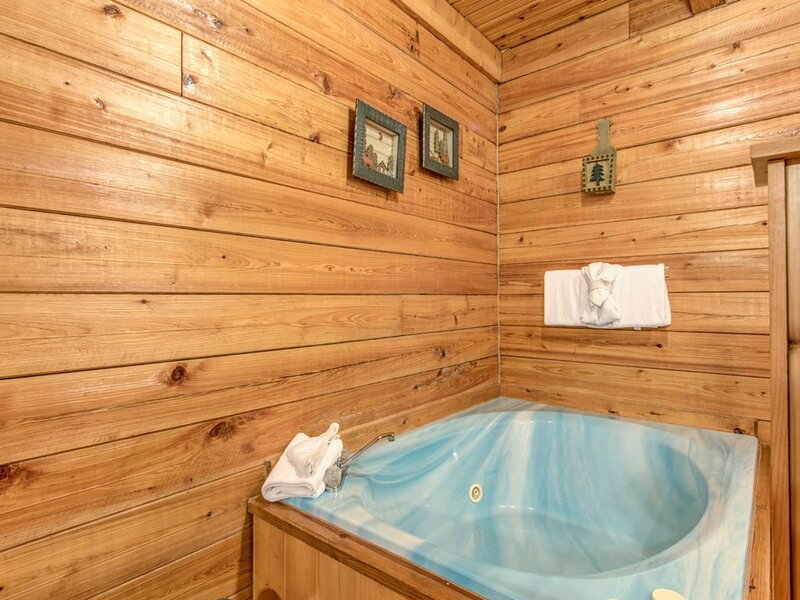 There’s a jetted tub indoors too, in the main level’s master bedroom. 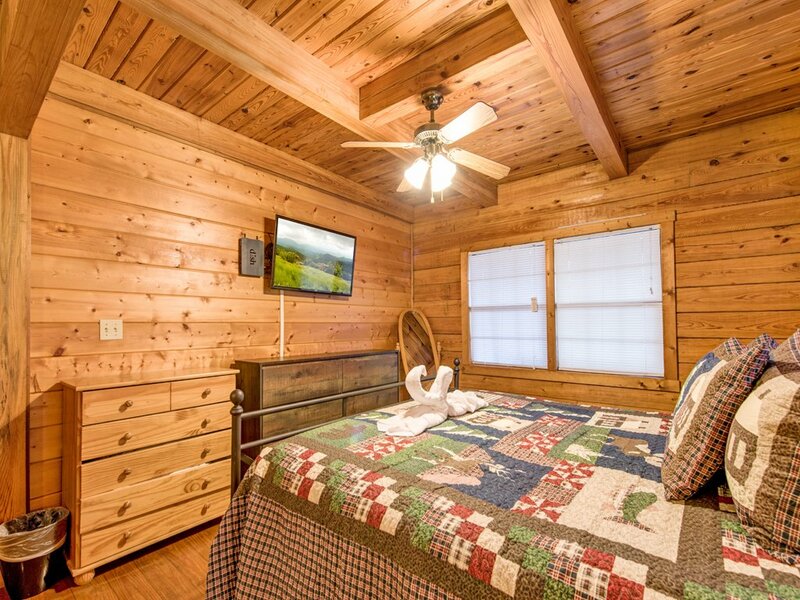 Along with the king-size bed, the flat-screen TV, the private bathroom, and the view of the Smokies from one of the windows, it ensures that the room is a retreat you’ll love spending time in. 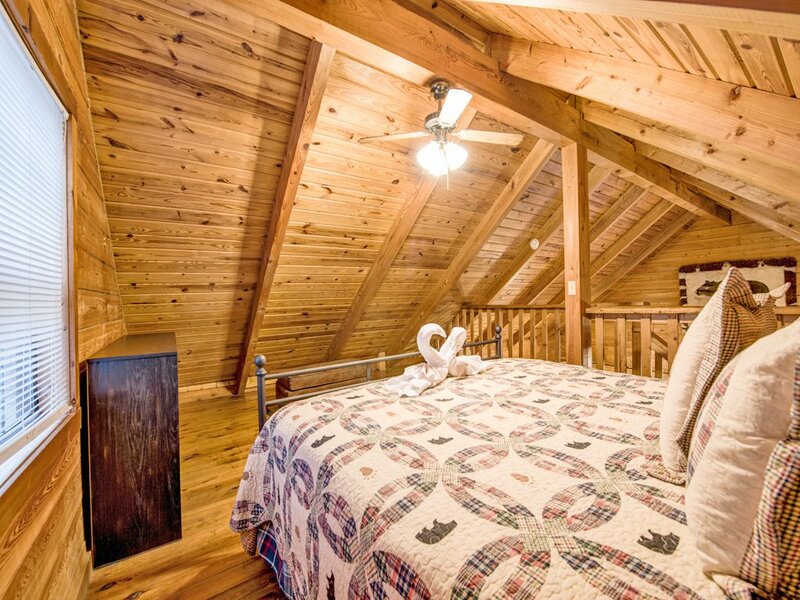 A second king-size bed is in the loft, which has been converted into a delightful sleeping quarters; the sloped, beamed ceiling adds to the charm. 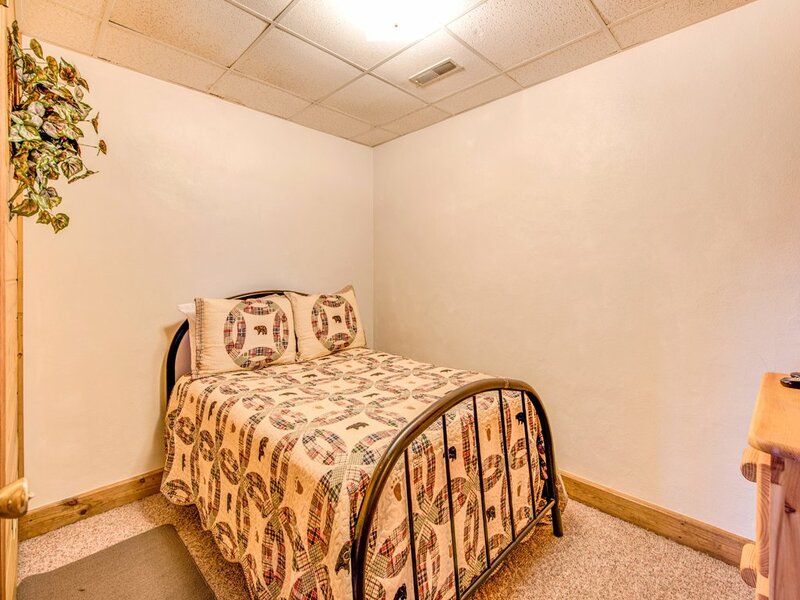 The remaining two bedrooms are on the lower level. One has a queen-size bed, while the other has a full. 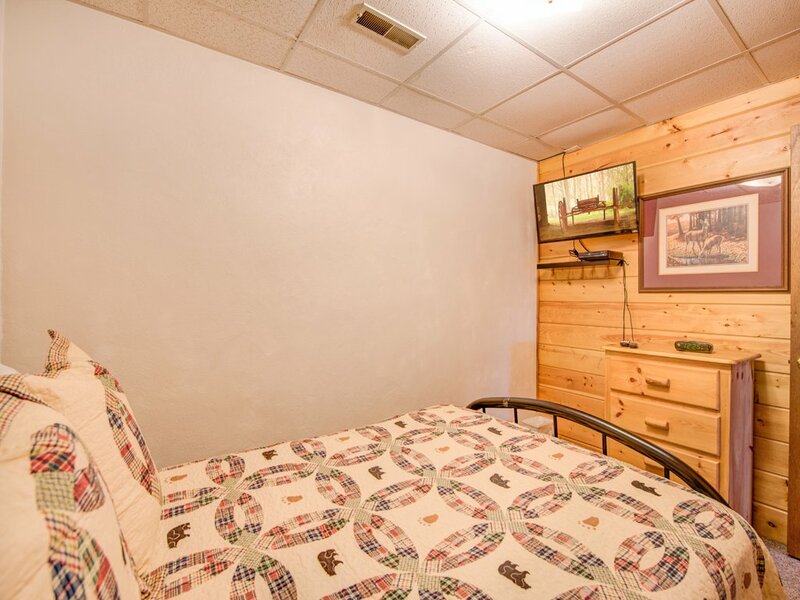 Each of these bedrooms has its own TV, and they share the cabin’s second full bathroom. 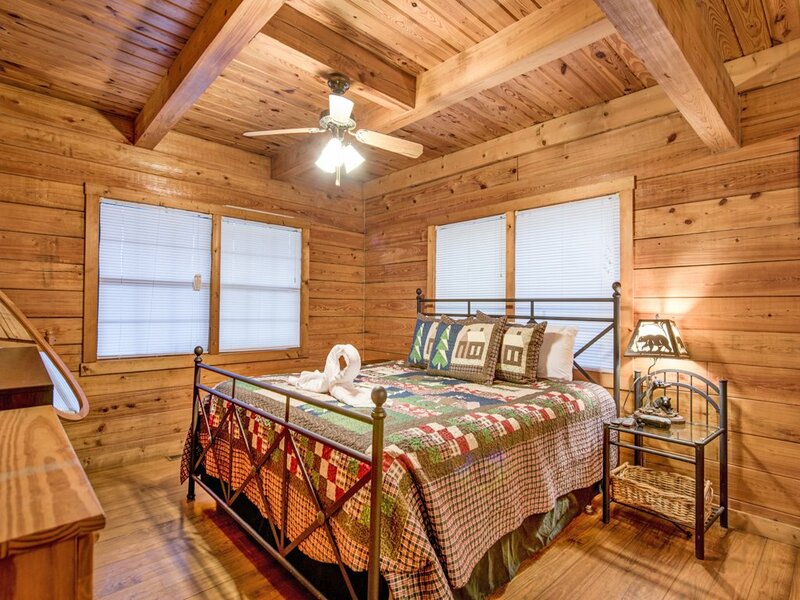 If you have additional guests, they can sleep on one of the great room’s sofas, which opens into a queen-size bed. 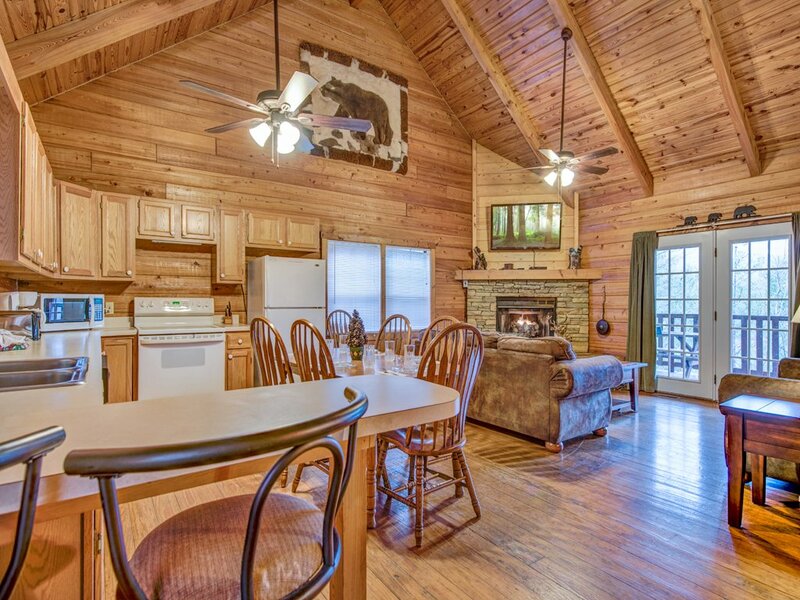 Encompassing a living area, a dining area, and the kitchen, the great room is on the main floor. 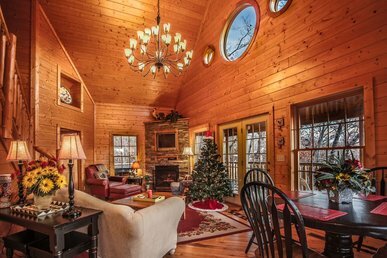 The towering cathedral ceiling and the lustrous wood-planked floor and walls lend it an airy, welcoming ambiance. 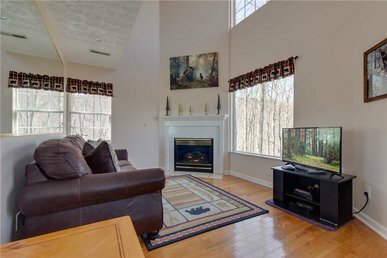 In winter, the golden glow of the stone-surround fireplace will make the space even more inviting. 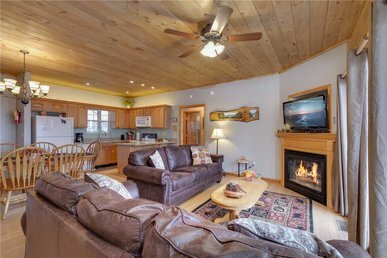 There’s plenty of room to nestle on the sofas to watch a movie on the flat-screen TV, play Pictionary, or get caught up on your reading. 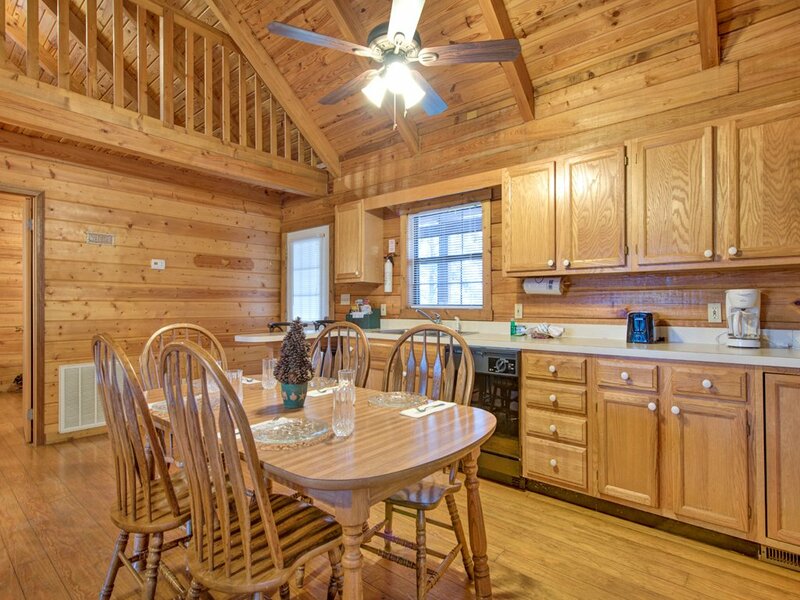 The dining table seats six, and the kitchen is equipped to handle just about any meal you want to make. 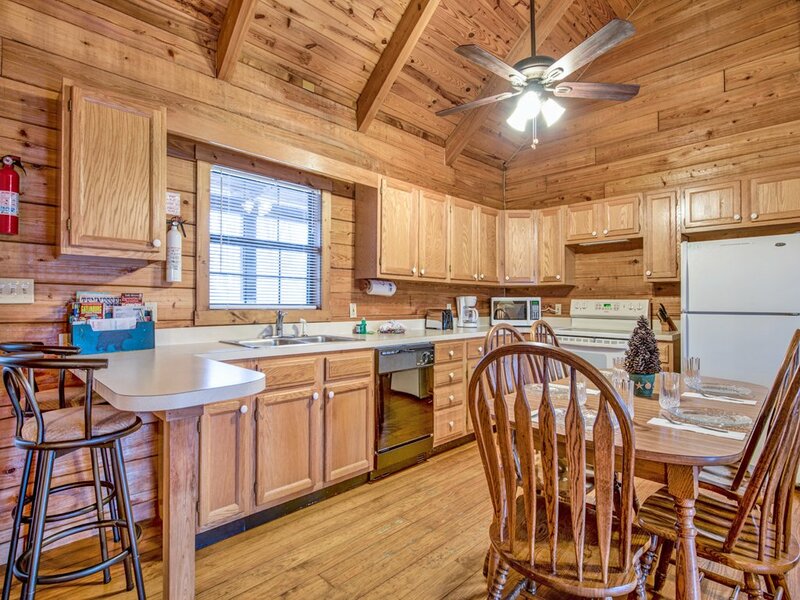 Refrigerator/freezer, oven/stove, microwave, coffeemaker, blender, toaster, plus plenty of cookware and tableware: Mountain Top View’s kitchen has it all. 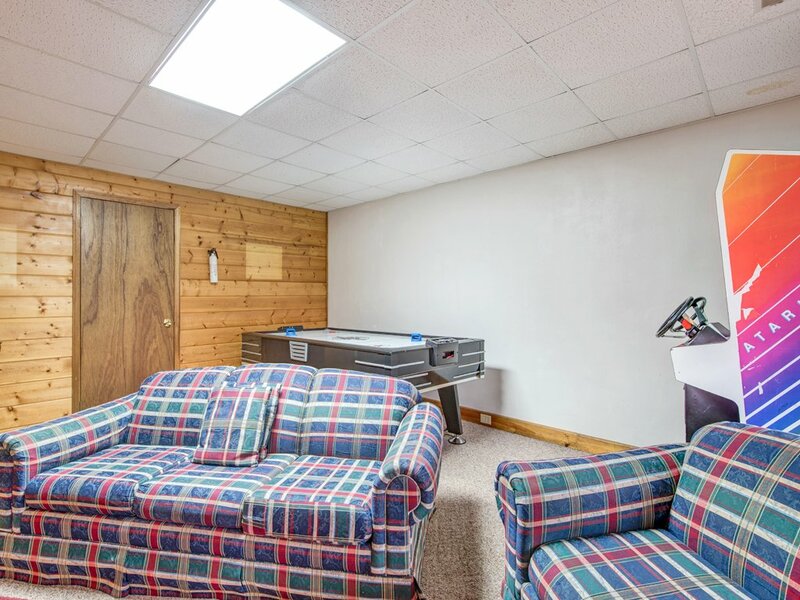 There’s even a dishwasher; after all, why wash dishes when you can head downstairs to the game room instead? 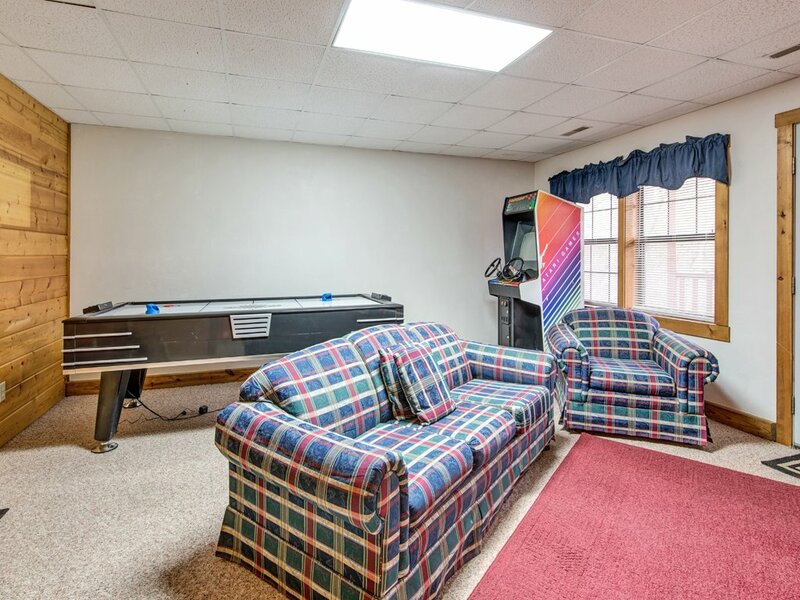 In the game room, you’ll find an air-hockey table and a two-player arcade, along with yet another flat-screen TV. 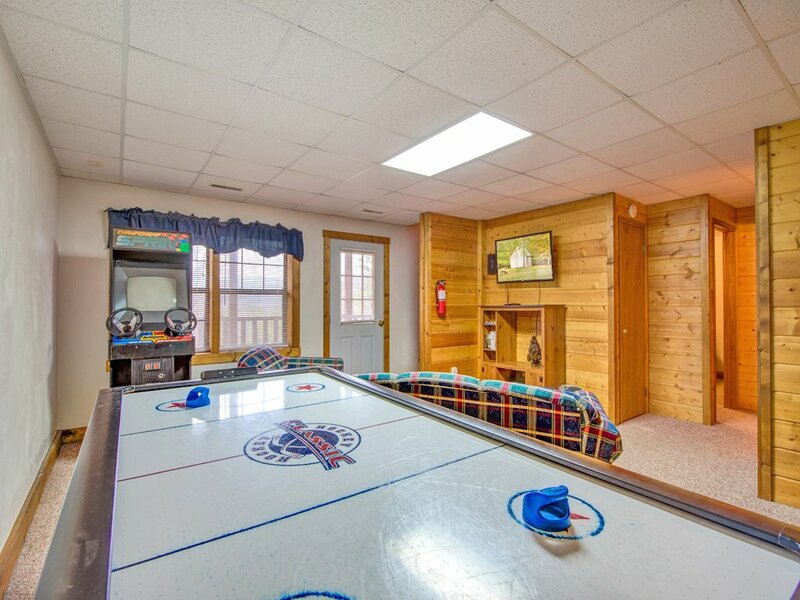 Of course, you don’t come to the Smoky Mountains to play air hockey all day. 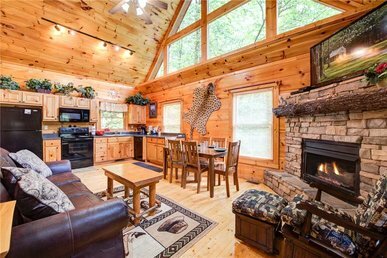 Mountain Top View is conveniently located between Pigeon Forge and Gatlinburg, so you can drive to the attractions of both towns in a jiffy. 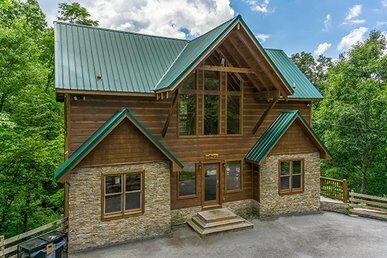 In less than ten minutes you can be at the Pigeon Forge Parkway, home to Dixie Stampede, the Titanic Museum, WonderWorks, a huge outlet mall, restaurants, theaters, and more. 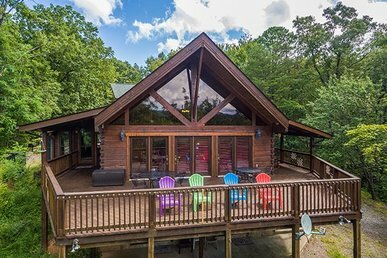 Nearly as close is downtown Gatlinburg, where you’ll find the Guinness World Records Museum, an aquarium, thrill rides, mini golf, more restaurants and shops, and a tram that will carry you over the town to Ober Gatlinburg Ski Area and Amusement Park. 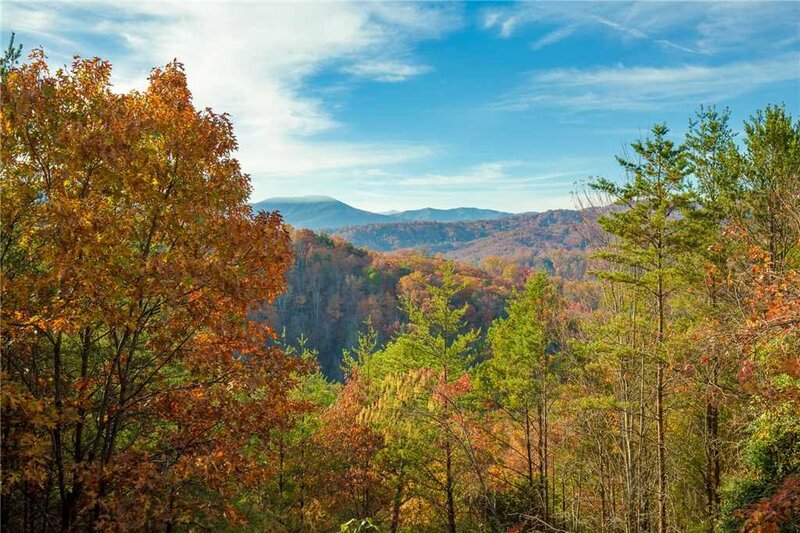 And less than twenty minutes away are Dollywood, Parrot Mountain and Gardens, and the Great Smoky Mountains National Park, three of the area’s top-rated attractions. 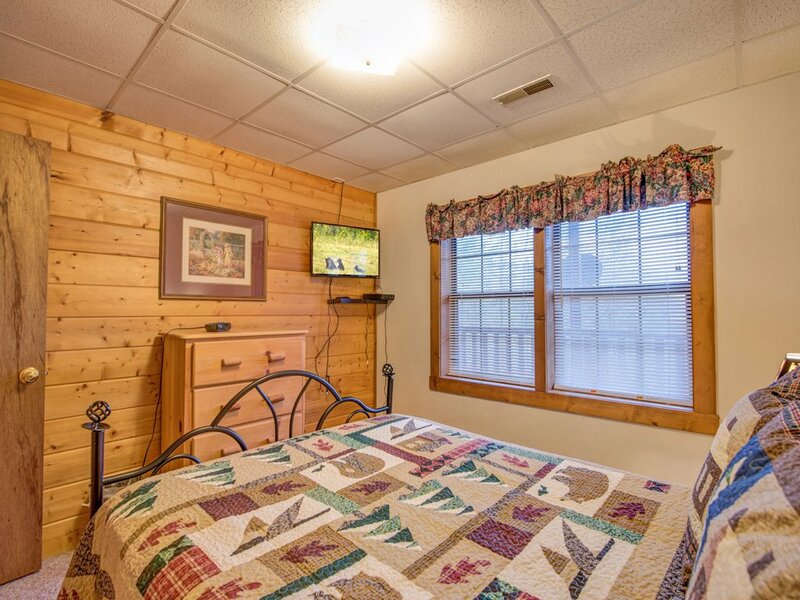 Whether you prefer hiking in the mountains or shouting with delight on roller coasters, shopping or skiing, dinner theaters or dining alfresco with songbirds providing the background music, you’ll love staying at Mountain Top View. 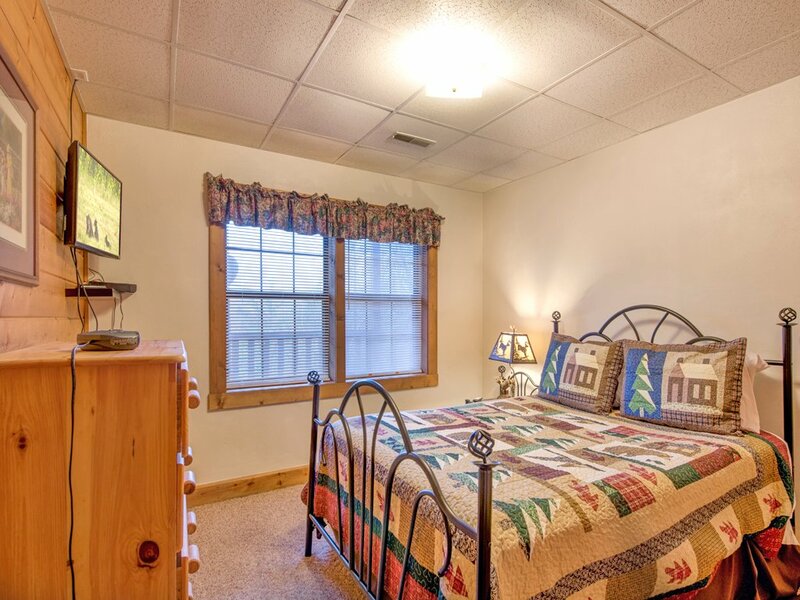 Experience it for yourself—book your stay today! Cabin had a great view and pretty good location. 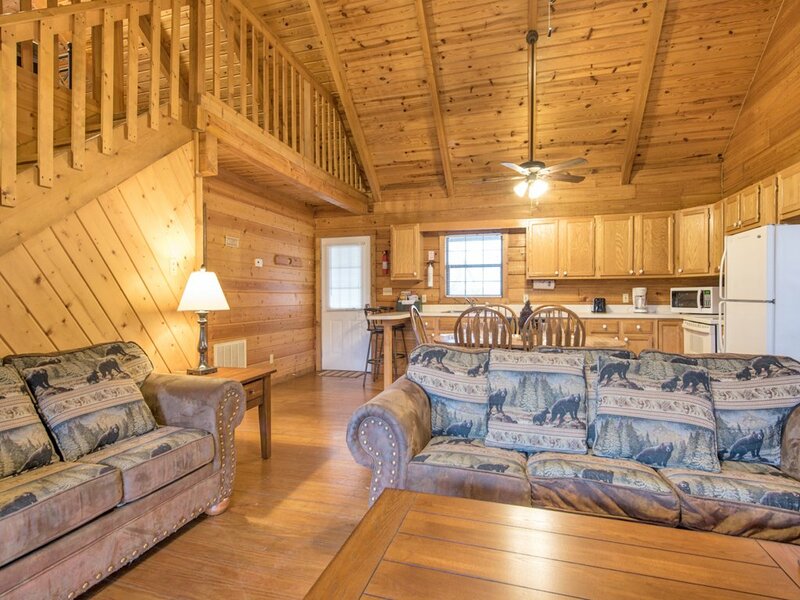 Cabin was not the cleanest. All the downstairs television did not work. There was no gas grill as advertised. Hot tub was nice and big. Several light bulbs were out downstairs. Downstairs had a terrible odor not clean smelling. We lost power for approximately 3 hours and when it came back on the water was dingy from then on out. 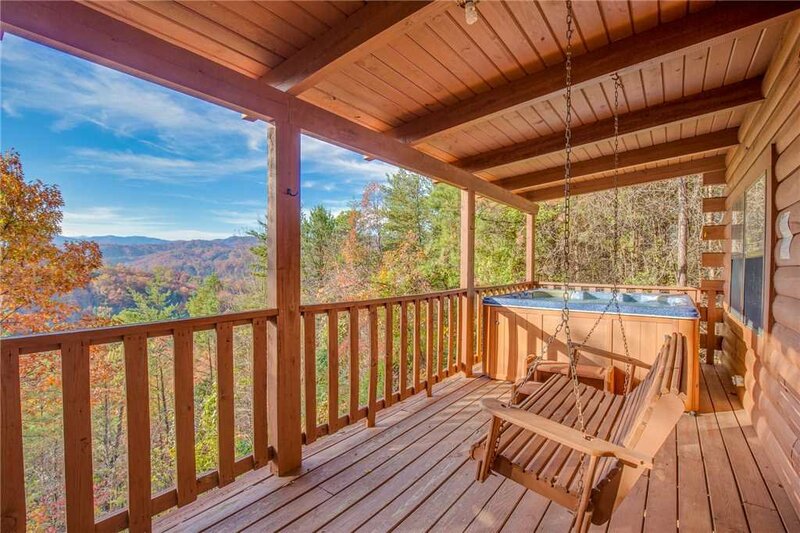 Great view, especially from the hot tub. 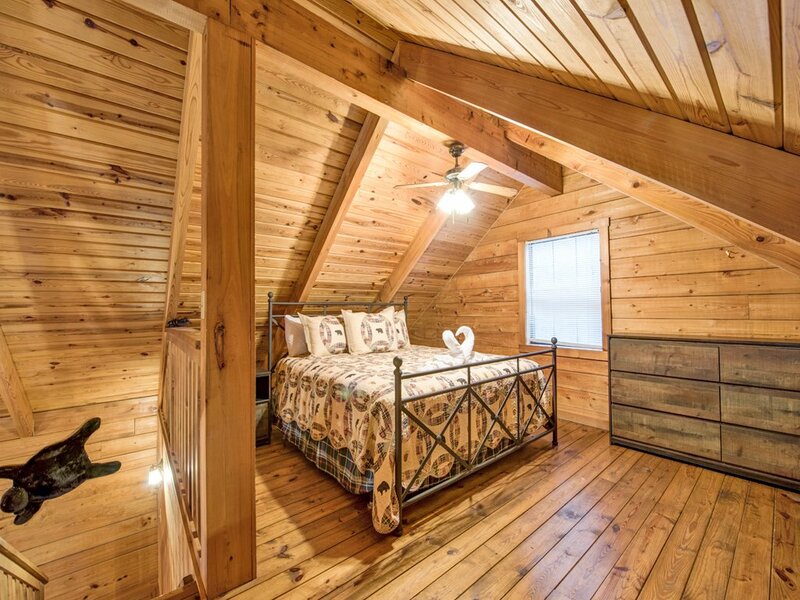 Nice and cozy just like youâ€™re at home. 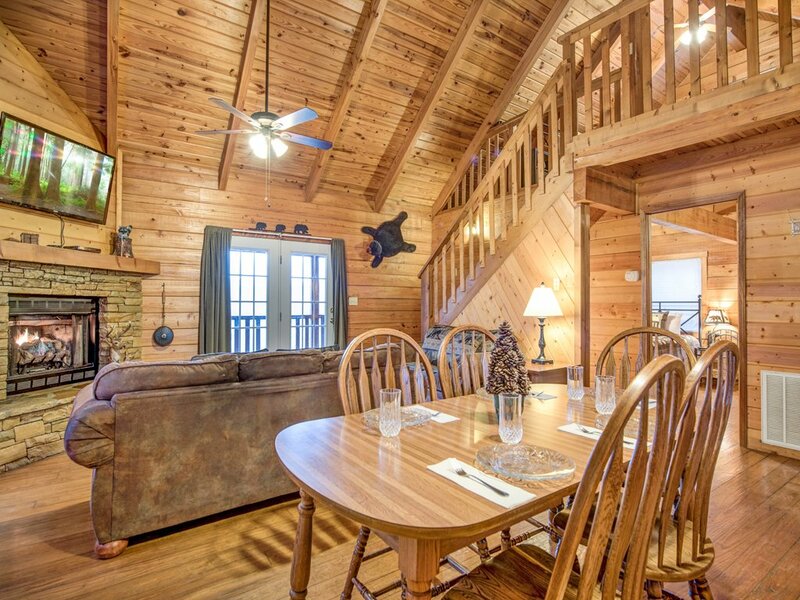 By far the best cabin I have ever stayed in. 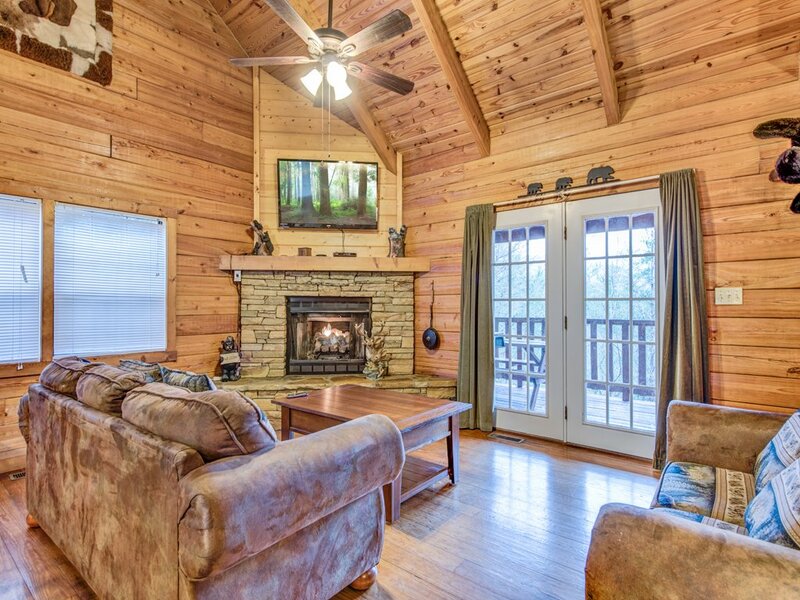 Me and my friends had tons of fun in the cabin. 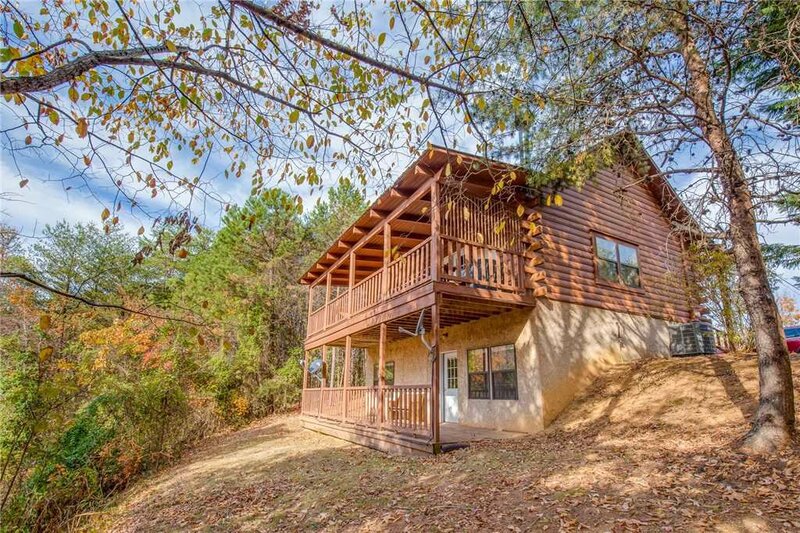 Perfect for 3 families w/ kids. 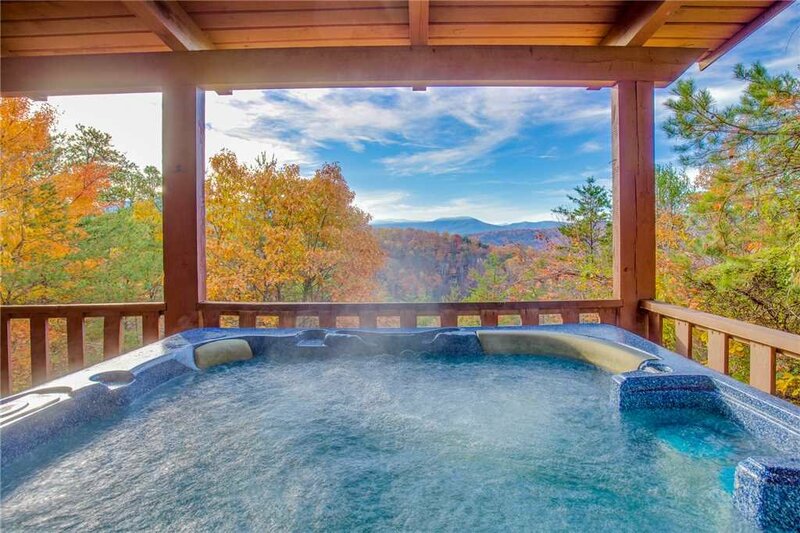 Good view and hot tub. But overall not anything like we expected and hoped. 1. Be prepared to chase bugs. 2. Master toilet is completely open. There is NO privacy. There is NO door. Did not expect that! 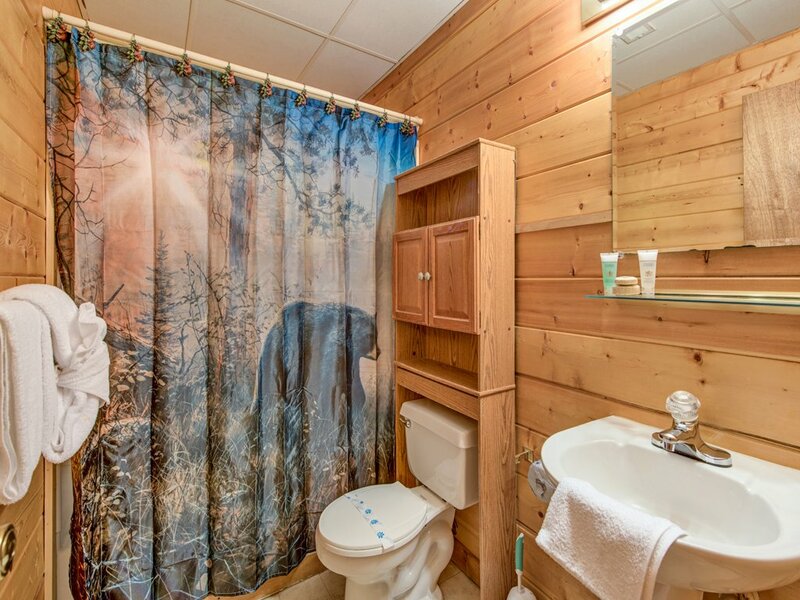 Donâ€™t think this can be considered a two bathroom house. 3. 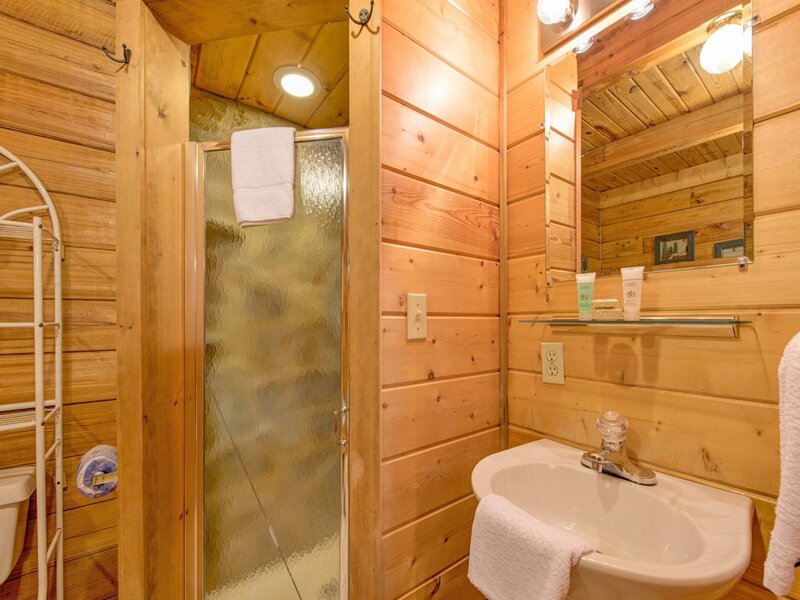 The master bathroom shower is extremely small and was very stinky. 4. Both toilets would not flush well and did not stop running. 5. The upstairs fan light does not turn off without turning the fan off and itâ€™s very hot upstairs. So we had to take the light bulbs out to make it work. 6. Vent in the Master bedroom must have something in it as it rattles all night. 7. The front door vent is very dirty and distinguishing looking. 8. There are spider webs in a lot of places. 9. Overall extremely dirty and dingy. We had high hopes based on the pictures but were very dissappointed.